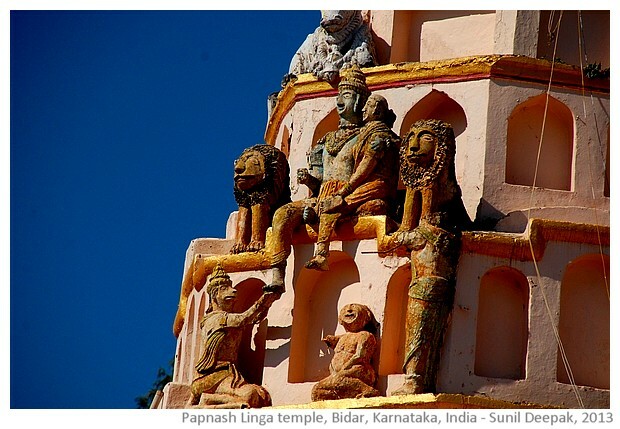 Bidar in north Karnataka (India) is rich in history and culture. However, it is not well known outside the region and gets relatively few tourists. 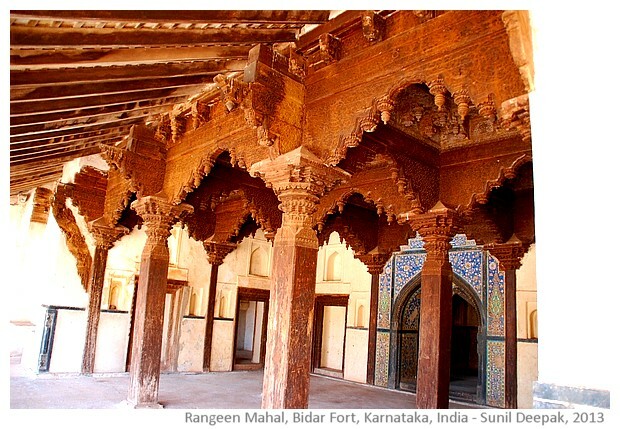 Bidar is just 3 hours' drive away from Hyderabad. 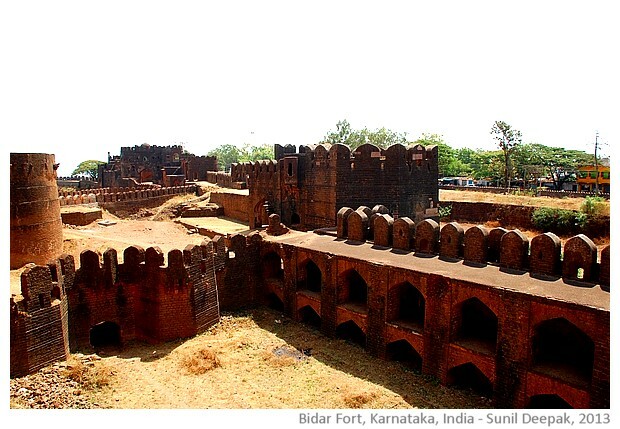 The most important tourist place of Bidar is its 15th century fort. However it has much more to offer. 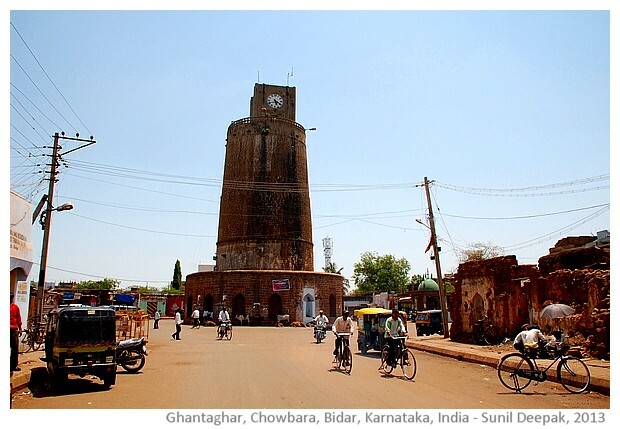 This post presents some of the main tourist attractions of Bidar. 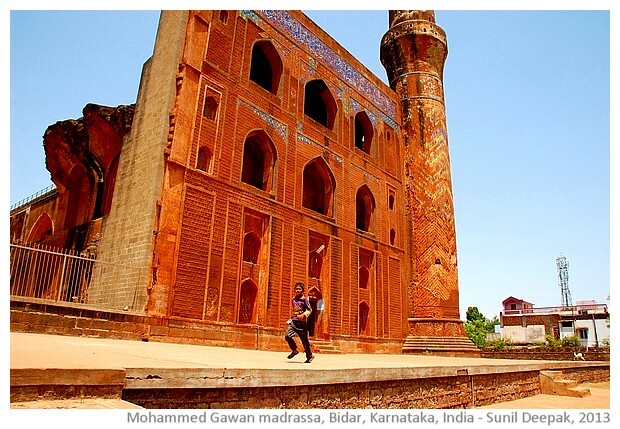 Bidar has been selected on the World Monument Watch list for 2014 for the preservation of its historical monuments. Hopefully, this fund will help the town in improving the tourist infrastructures and maintenance of its historical buildings. The nearest airport is in Hyderabad on the National Highway 9 (the Mumbai-Hyderabad highway). I had travelled on this road in 2009 and the quality of highway was good at that time. The journey had taken less than 3 hours. This year (2013), some stretches of the road were very bad and the journey took almost 4 hours. Hyderabad and Bidar are also connected by trains (3.5 to 5 hours) and buses. You can also find buses for Bidar from Bangalore and other cities of Karnataka such as Hospet (near Hampi). 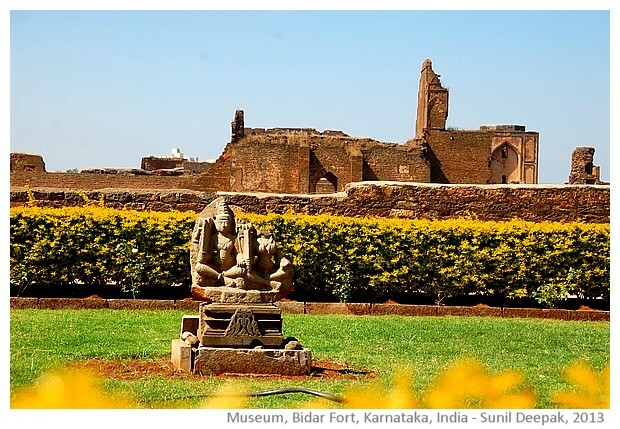 Recorded history of Bidar begins with the Mauryan empire around 300 BC and was followed by different dynasties including the Chalukya (6 to 12 century AD) and Kalachuri empires (12 to 14th century). The capital of Chalukya and Kalachuri empires was in Kalyani (present day Basavakalyan) about 40 km from Bidar. Basveshwara or Basvanna, prime minister of Kalachuri kings in 12th century, was a key figure of the Hindu social reforms and is still a venerated figure in the region. 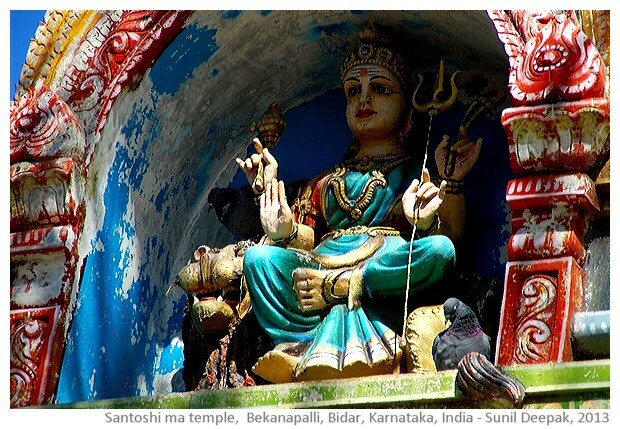 Almost all the villages and towns of north Karnataka have the statue of Basvanna sitting on his horse at some prominent place. You can read more about Basavanna and his tradition of Hindu reformist poet-saints in my post. Early 14th century saw the arrival of Turkish-Afghani rulers from Delhi, starting with Allauddin Khilji and Muhammed Bin Tughluq. An Afghani general of Tughluq, Bahman Shah initiated the Bahmani kingdom at Ahsanabad (present day Gulbarga, about 120 km from Bidar). In 15th century the Bahmani kings shifted their capital to Bidar and built the Bidar fort, at the site of a pre-existing fort. 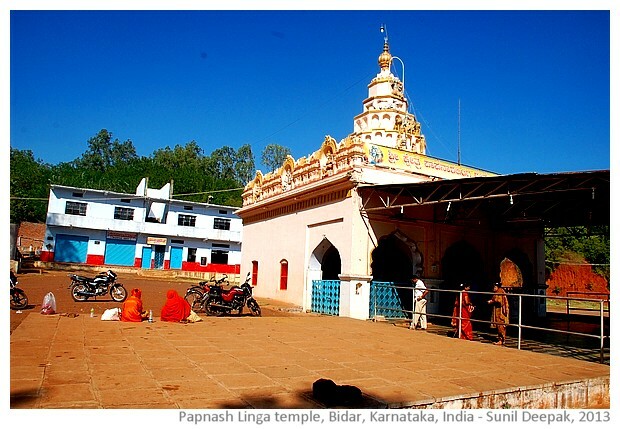 In 1527 AD the Bhamani kingdom was taken over by Bareed Shahi, who started his own kingdom that ruled over Bidar and surrounding areas of Deccan for a century. 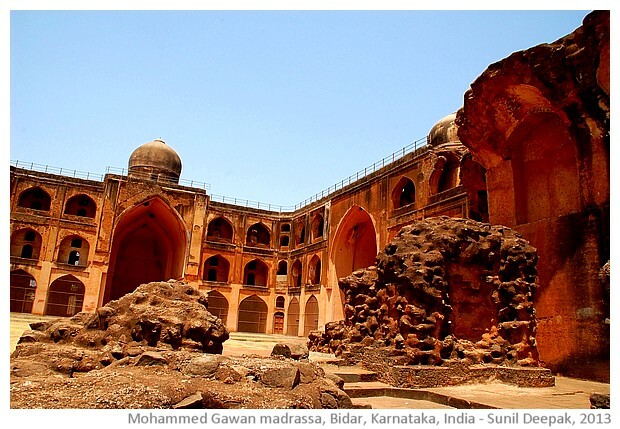 Bidar then came under the Mughal empire, through the Nizam of Hyderabad. In 1948, the kingdom of Nizam of Hyderabad was merged in the Indian republic. This brief overview of the history of the region explains the presence of different influences from different parts of the world in Bidar. 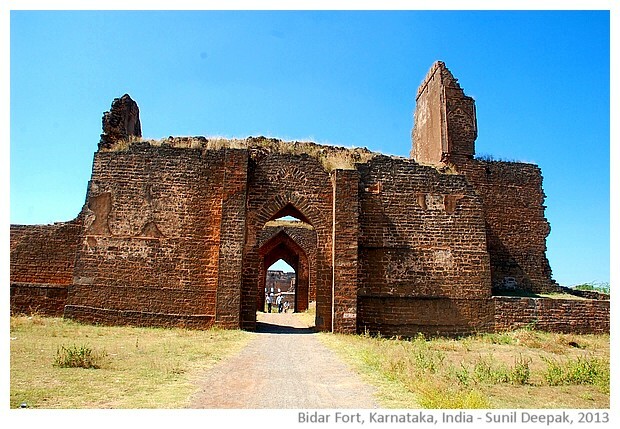 Bidar fort is a huge area surrounded by thick walls and a moat. Inside the citadel there are different buildings and ruins that can be visited. A narrow road enters the main entrance of the fort and leads to an open parking space. Before proceeding towards different buildings, take a walk back towards the entrance to see the external and internal walls and the overall structure of the fort. This is the best preserved part of the whole complex. You can climb up to the platform on the inner wall to admire the robust defensive structure of the building including the imposing Gumbaz Darwaza (Gate with the dome) with clear influence of Persian architecture. 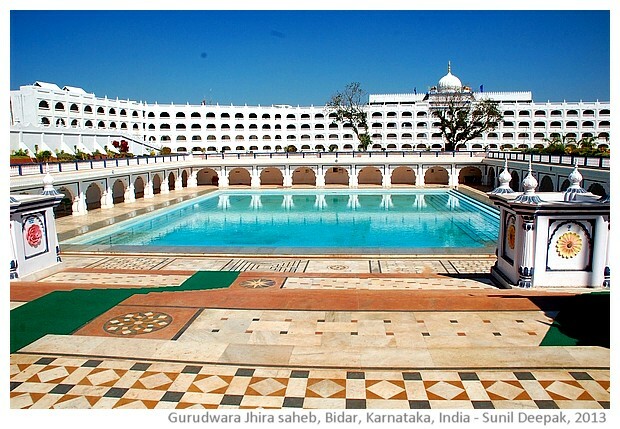 The image below shows the Gagan Mahal (sky palace) with its garden and the fountain. This palace was used by the king for his harem. On the right side of the image you can also see the "Solah Khamb mosque", the mosque of 16 pillars, also called the "zenana mosque" (women's mosque) as it was close to the harem. The low building in front of the Gagan Mahal is used as a museum. It hosts pieces of ceramics and armament from 15th century and some older Hindu sculptures. The museum is old fashioned with signs prohibiting photography or videos. Personally I feel that today such laws banning photography are not useful (if you really wish, you can "steal" pictures with your mobile) because today the world is all about sharing pictures about your visits through facebook and blogs, which help in creating awareness (and free publicity) about the places and bringing more visitors. The image below shows a sculpture from the garden outside the fort museum. In 2011, we had gone on car through the fort grounds to visit different buildings inside the fort. However now (2013) cars are not allowed to go inside and you need to walk, which is actually not bad since it allows you to spend more time to see the different buildings and ruins (like the one shown in the first image at the top of this post). 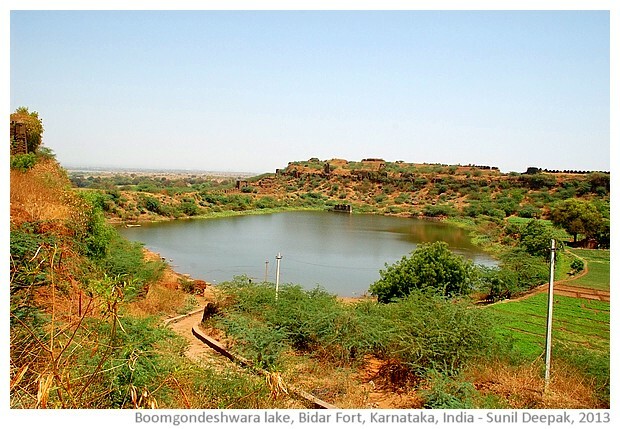 One of the most scenic places to visit inside the Bidar fort is the Boomgondeshwara lake surrounded by verdant fields. According to the person accompanying us, this lake is supposed to be very deep, though I had seen boys taking bath in it so probably parts of it are not so deep. One of the most beautiful buildings inside the fort is the Rangeen Mahal (Palace of colours), that I had visited in 2011. Placed just after the main entrance, close to the parking, it is decorated with coloured tiles and beautifully sculptured stones, showing a mixture of different architectural styles. However, in 2013, I found that this building was closed to visitors. Hopefully the funds from the World Monument Watch will help in its restoration and it will be opened to public. This is a small but old Shiva temple on the outskirts of Bidar, placed on a small hill inside a verdant valley close to a lake. Below the steps of the temple, covered with a small white chattri (dome) is a natural water spring. People believe that taking bath in the waters of this spring leads to pap nash (cleaning of the sins), giving this temple its name. Pilgrims come from far away to visit this temple. "The affirmation of the everywhere of the sacred – this is the peculiar genius of the theology given expression in the landscape of India." No one, she writes, "says it better than the poet saints of south India who praise the supreme lord who is right here where the rivers meet, right here where the herons wade, right here where the hillock rises, right here where the palms sway over the estuary, right here where the mango blossoms are fragrant. The places they praise are different. The taste of the lord is different in each. But each one is a 'beloved place', and each one enables the pilgrim soul to catch a glimpse of the vast reality of God." 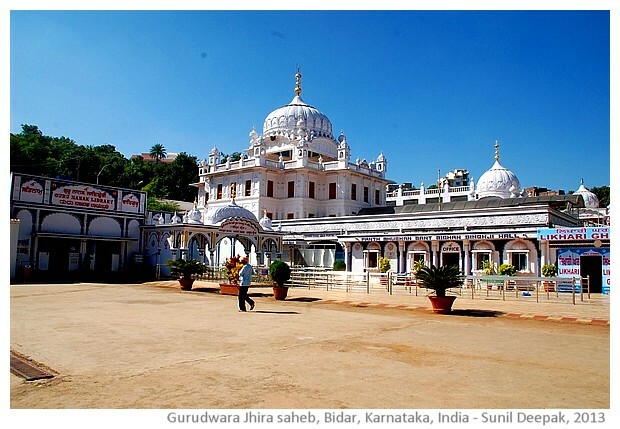 Guru Nanak, the founder of Sikh religion, came to Bidar in 15th century and his visit is linked to the discovery of a sweet water spring (Jhira). The sikh temple ("gurudwara" or the "door to the Guru") of Nanek Jhira Saheb stands at that place. The beautiful white building with a huge hostel for travellers and an amrit pond (nectar pond) with the spring water repeat the ideas of nature's sacredness as described above for the Papnash temple. However, compared to the temple, the Gurudwara is more imposing and better maintained. 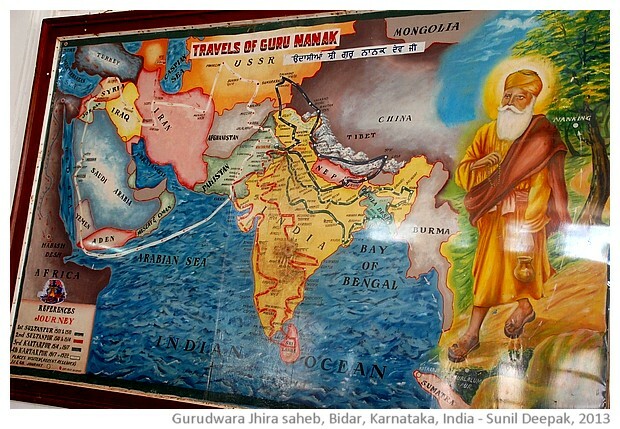 A big picture in one of the Gurudwara buildings shows the journeys of Guru Nanek in India and in other countries. The biography of Nanek says that he had also visited "Turkey, Italy and Soviet Union". However, the map of his journeys does not show his visit to Turkey and Italy. On the other hand, now that Soviet Union is no more and places visited by Guru Nanak are independent countries (probably he had travelled through Turkmenistan, Uzbekistan, Kazakistan and Kyrgyzstan), this list needs to be updated. 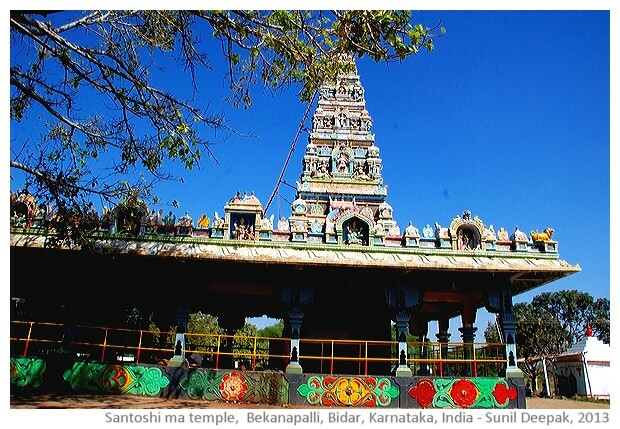 The small and unassuming temple to goddess Santoshi Ma in Bekanapalli, on the outskirts of Bidar, behind the Bidar fort, is an important pilgrimage place. Followers gather here on every Tuesday and Friday. 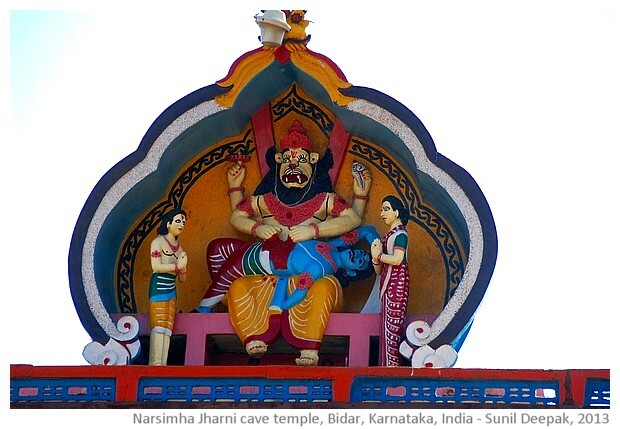 Downhill from Bidar, on the outskirts of the city is the Jharni Narsimha Cave temple (Narsimha or the Man-tiger - an incarnation of Vishnu). A walk down the stairs lined by shops selling trinkets and things needed for the temple prayers, leads you to an unassuming temple on one side and an open air bathroom on the other. Inside the temple, there is a small statue and behind it, steps lead to a cave with water flowing at its base. You need to wade through waist deep water for about 90 metres to reach the second temple, where a water spring comes out and on the rocky wall you can see the back of the deity Narsimha. I did not want to get my clothes wet and I am afraid of narrow and dark closed spaces, so I did not get into the water to visit the inner temple. 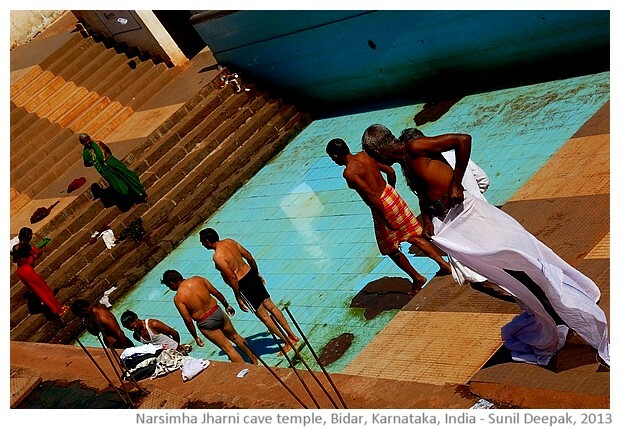 For persons like me, if you are keen to wash your sins and purify your soul in the sacred spring water, you can take a bath in the open-air bathroom on the other side of the temple. The 15th century Gawan university building is an example of Persian style Bahmani architecture. It was built in 1472 by Khawaja Mahmud Gawan, minister of the Bahmani kings. It was a residential university. The three storey building housed a library, a mosque, lecture halls, houses of the professors and rooms for the students. It had two three-tiered minaars (turrets), one of which can still be seen. Multi-coloured tiles on its outer surface with arabesques and Koranic writings gave it a distinctive appearance. 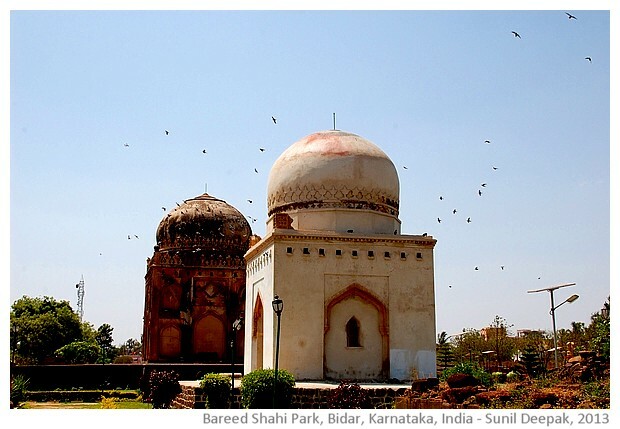 Few kilometres outside Bidar, at Ashtur there are 12 Bahmani tombs, that are worth a visit. However, we did not have time and limited our visit to the Barid Shahi tombs in the city. 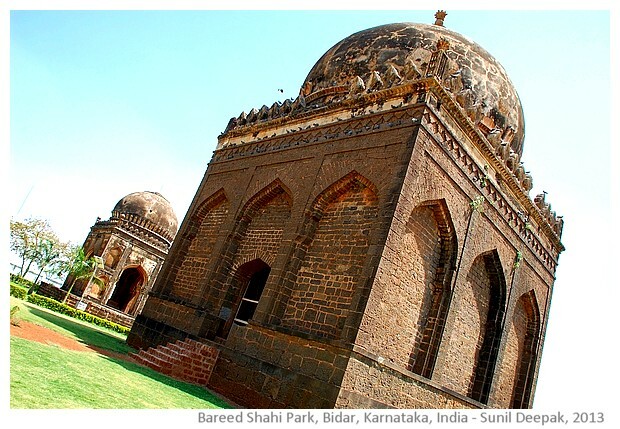 Barid Shah had replaced the Bahmani rulers and his dynasty had ruled Bidar till 1619 AD. The tombs in the Barid Shahi park are of the family of king Kasim Barid II (1587-91 AD). According to the local legends one of these tombs is supposed to be of Chand bibi (Chand Sultana), the regent of Bijapur (1580-90 AD) and a warrior, who had fought against the forces of Mughal emperor Akbar. However, others believe that her tomb is in Ahmednagar, in a building known as "Chand Bibi ka Mahal". 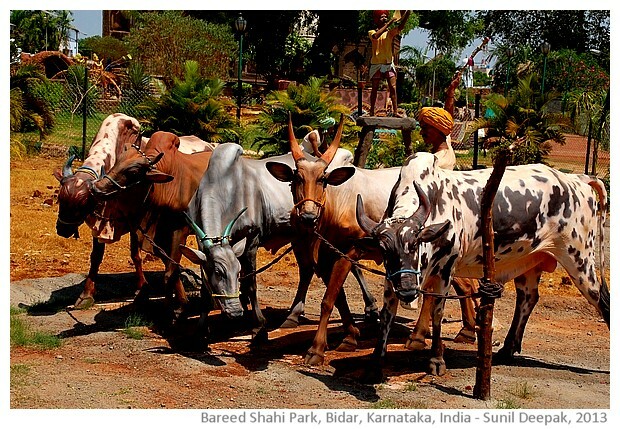 The park also has some colourful (few are tacky) looking statues showing scenes from the local village life, like the man with his cows in the image below. The clock tower of Chowbara (literally a four-sided platform) is a 22 metres high defensive watch tower in the old city, near Mahmud Gawan Madrassa and the Jama Masjid mosque. The top of the tower is supposed to give you a panoramic view of the surroundings. However when we had visited, its stairs were closed. 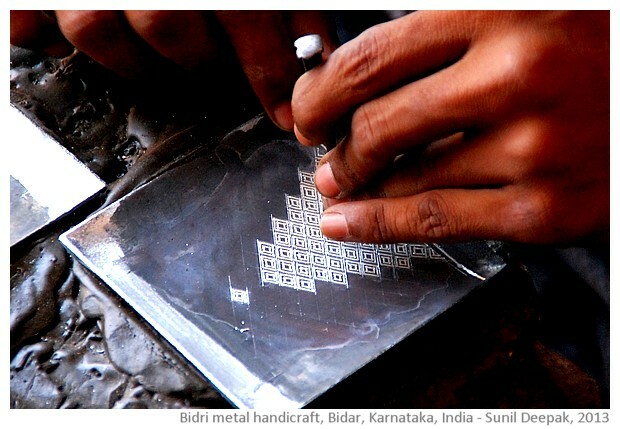 This part of the old city is full of small workshops where traditional artisans make the ancient art of "Bidri", that is designs made on a metal by in-laying with silver or other materials. You can visit these shops to see these artisans at work, working patiently with silver wires and with very basic instruments, sitting on the ground. 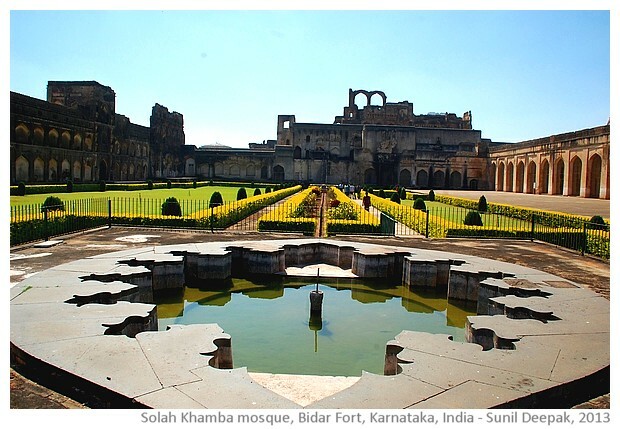 Apart from Bidar city, there are some other important places to visit in the district of Bidar. 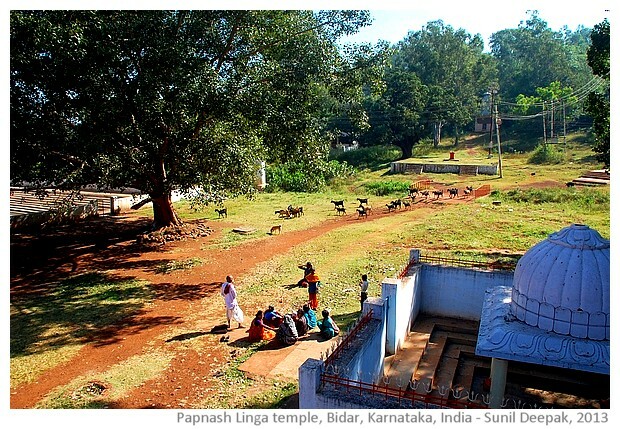 These include the Basavanna shrine in Basvankalyan, about which I have written a separate post. 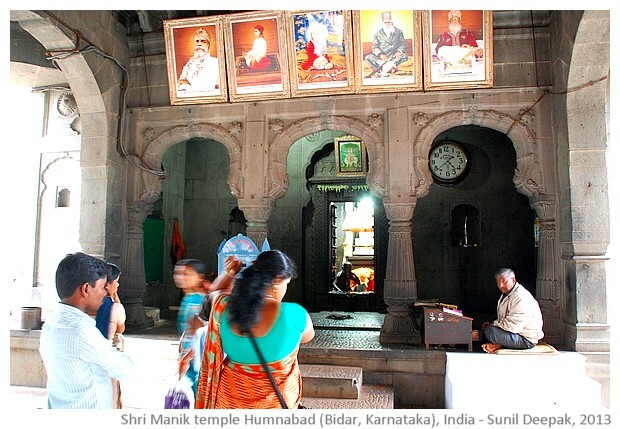 Other important places are Manikprabhu Devasthan in Humnabad and the Madonna shrine in Bhalki. Manik Prabhu Devasthan in the periphery of Humnabad (about 30 km from Bidar) is devoted to an ascetic guru Manik Prabhu (1817-1865). His spiritual legacy is continued by the persons of his family who act as the guru of this sect. 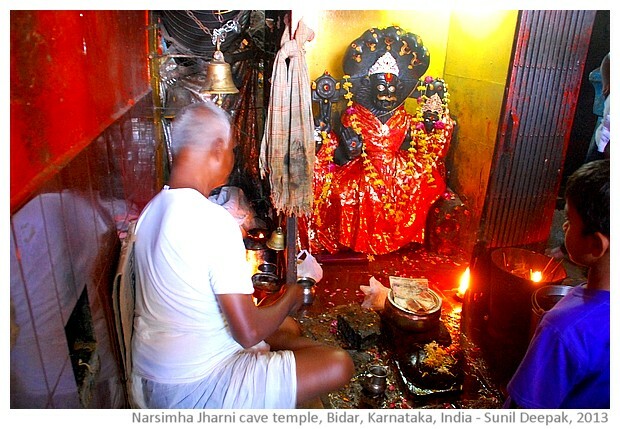 The gurus are is shown like kings with a crowns, in the pictures above the shrine (very different looking compared to the usual Hindu ascetics and gurus). The present guru has a rich palace like house close to the temple, showing that his followers contribute generously. 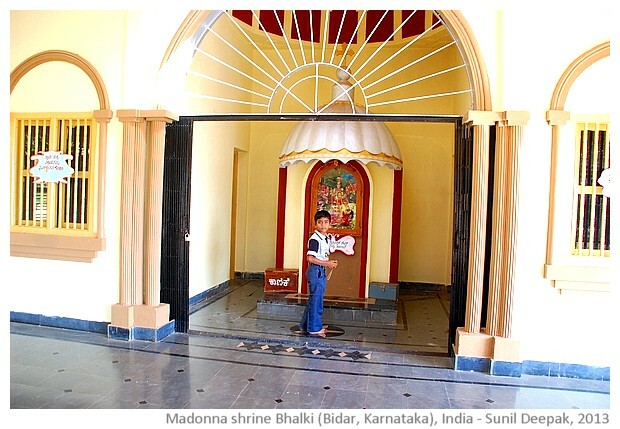 On the other hand, the shrine to Madonna in Bhalki town (about 40 km from Bidar) is a pilgrimage site for Catholic christians of the region. 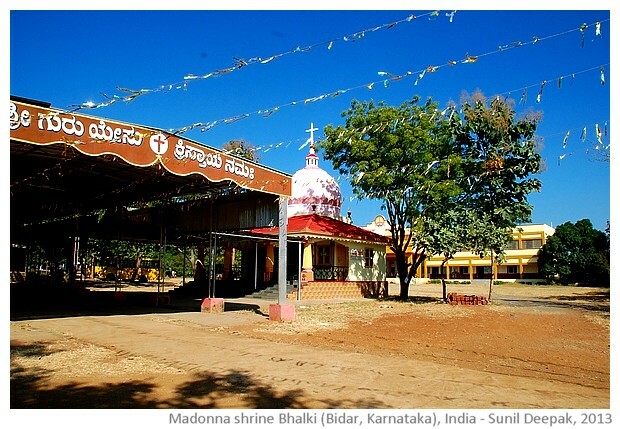 In the first week of November, every year hundreds of followers of Madonna, walk to this shrine accompanied by floats, music, prayers and processions. 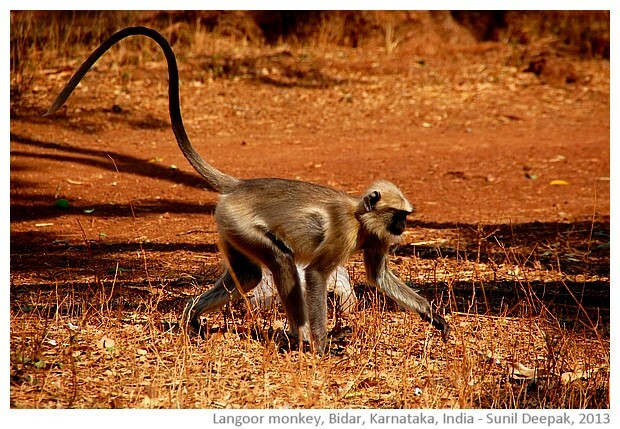 To conclude this picture essay, the last image is of a Gray langur monkey (Semnopithecus entellus) from Bidar - a gray coloured monkey with a black face. It is also known as Hanuman langur. It is just one example of large variety of birds and animals in the area. If you have been to Bidar and know of other interesting places to visit that I have missed in my visit, do let me know.